Five years ago, my wife bought a juniper green Hyundai Santa Fe. She named it Sam. The car’s rear-view camera has eliminated her unfortunate tendency to back into other vehicles, and its Blue Link navigation system makes us both feel more secure when she drives home from her girls’-night-outs. She loves that car. Recently, I decided it was my turn for a new vehicle, so I jumped in my tired 2001 Ford Ranger and headed down to the auto mall. Boy, have things changed in five years. Hands-free parallel parking. Sync 3 voice control. Lane keeping and blind spot information systems. The future of electric cars was still in question when my wife bought her Hyundai; now every car manufacturer has some sort of EV or hybrid. And autonomous driving? Not today, but probably by the time she’s ready to trade in her beloved Sam. Looking at all that driving technology, one really has to hand it to automakers. There’s no sitting on their laurels for these folks. For those of us who grew up with the Ford Pinto and the AMC Pacer and actually admit to having once owned a Chevette Scooter, the current race toward safer, smarter and ever more fuel-efficient cars is a breath of fresh air. So how about a round of applause for Ford, BMW, Toyota and all the other automotive pioneers – and especially for newcomers like Tesla and Waymo? Without them, it’s unlikely the current wave of innovation would have made it past the concept-car stage. The reality, however, is that much of the technological acclaim should go to the car manufacturers’ suppliers. Granted, it’s not their logo perched on the grill, but without companies, such as Robert Bosch and Denso Corp., Johnson Controls (now Adient) and Delphi Automotive, it’s unlikely our cars, trucks and SUVs would have half the high-tech features we’re currently enjoying. For example, Bosch’s Human Machine Interface (HMI) promises to keep drivers awake, pull up their favorite playlist and find them the best parking spot downtown. By 2019, Delphi and Mobileye plan to deliver their self-driving system, centralized sensing localization and planning system. And Denso is working toward holographic displays and haptic-feedback for hands-free driving as well as the “next generation” persuasive electric vehicle, an autonomous, electric, shareable three-wheeled vehicle. Another important player in the new technology arena is Magna International Inc. Ranking third on Automotive News’ Top 100 list of global OEM suppliers (and the largest Tier 1 supplier in North America), this Ontario-based company boasts 159,000 employees, 317 manufacturing locations and 102 product development centers globally. And, it provides body, chassis and exterior components, seating and powertrain assemblies, electronics, vision systems and more to virtually every car and truck maker in the world. It wasn’t always like this. In 1957, Magna founder Frank Stronach operated a one-man tool and die shop called Multimatic, with annual revenue of just $13,000. His first big break came two years later with an order from General Motors for the stamped metal clips used to make sun visors. In 1968, the now established Multimatic merged with Magna Electronics, a leader in the aircraft and defense industries. By 1973, the new company had changed its name to Magna International Inc., with Stronach as chairman of the board. Over the coming decades, the company continued to grow. In 1981, Magna sold off its aerospace and defense work to focus its efforts on the automotive industry, and three years later, it expanded into Europe followed by Mexico in 1993. 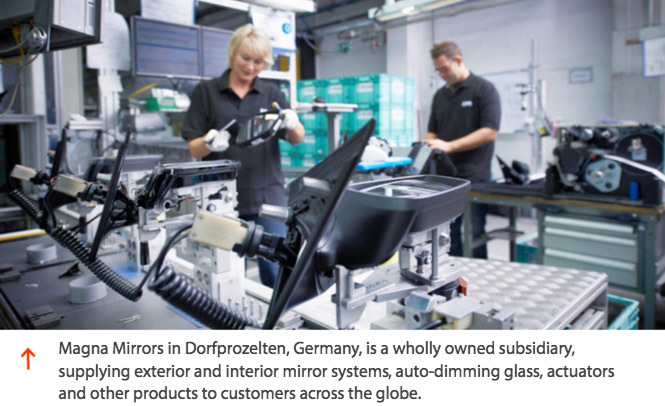 It also acquired several companies along the way, including car designer and manufacturer Steyr-Daimler-Puch, automotive mirror giant Donnelly Corp. and CTS Fahrzeug-Dachsysteme, Porsche’s roof system subsidiary. Today, Magna International enjoys $32 billion in annual sales. It has enough supplier-performance and excellence-in-quality awards to fill a tractor trailer and recently received the Center of Automotive Management’s most-innovative-supplier award for development of a steel-to-aluminum welding process, its second such award in three years. Magna’s innovations don’t stop at the factory floor, however. 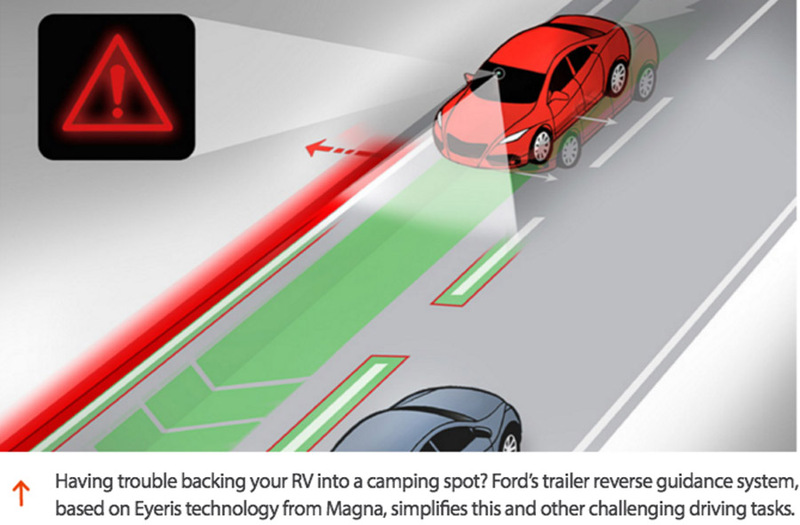 Magna’s Eyeris electronic vision system uses front, side and rear cameras to provide a 360-degree view of the driver’s surroundings, displaying it on an 8.4-in. touchscreen. If you’re lucky enough to drive a Maserati Levante, the Eyeris will detect pedestrians, help avoid collisions and make parallel parking a breeze. Ever kick yourself for buying a four-wheel drive vehicle when it only snows twice a year? Magna’s Flex4 AWD technology automatically decouples the car’s rear axle when driving conditions permit, but applies torque within 100 milliseconds if it detects slippery roads. This improves fuel economy and vehicle handling, two reasons why the system was adopted for the Audi A4 Quattro. 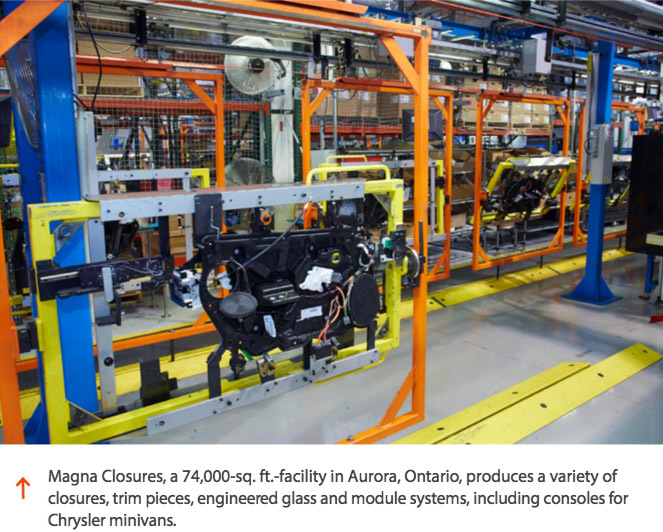 In collaboration with Ford Motor Co., Magna designers used a clean-sheet-of-paper approach to completely redesign one of its vehicle sub-frame assemblies. The result is a carbon fiber prototype that has 34 percent less mass and 87 percent fewer components compared to its stamped metal predecessor. In a similar vein, Magna worked recently with the U.S. Department of Energy to develop an ultralight door frame, reducing component weight by 42 percent. Engineers on the project said this was made possible by knowledge they’d gained several years earlier, while working with Ford and the DOE on the multi-material lightweight vehicle program. Recognizing that it’s not the only one with good ideas, Magna recently partnered with Silicon Valley technology startup firm RocketSpace on an accelerator program intended to bring “automotive innovation in areas that include electric vehicle systems, automated driver assisted systems and secure vehicle connectivity.” Magna has also provided $5 million to Canada’s Vector Institute to help fund research on artificial intelligence and machine learning. With an eye toward solving the problems of long recharge times for electric vehicles and a shortage of hydrogen fuel cell refueling stations, Magna has developed a best of both worlds solution: the fuel cell range extended electric vehicle concept car, a Mercedes Viano multi-purpose vehicle (automaker-speak for minivan) retrofitted with an onboard battery recharging unit. Although the design isn’t slated for production, it provides a look into the “what’s possible” type of innovation for which Magna is known. 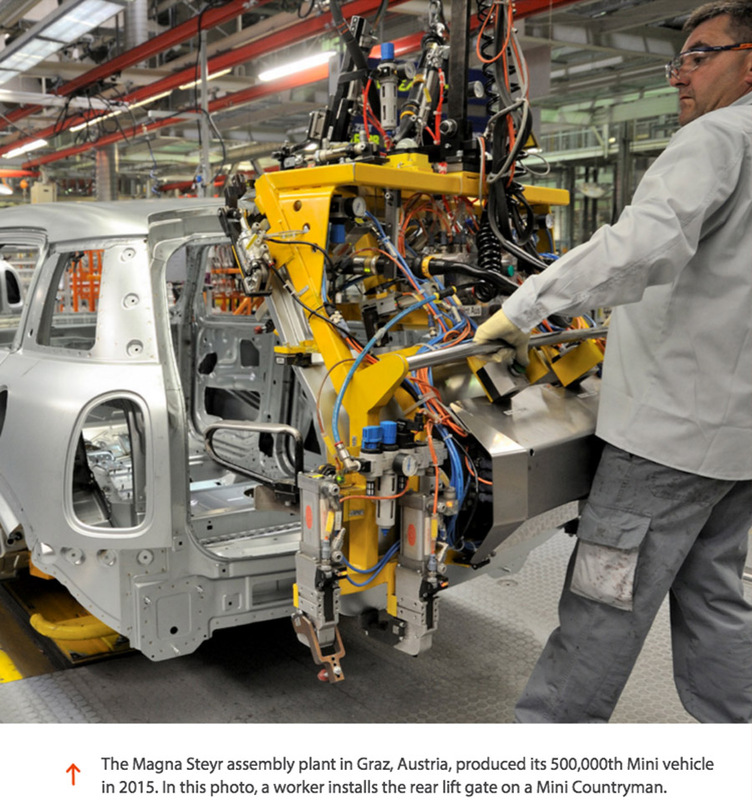 Magna’s interests and initiatives extend well beyond the world of automobiles. The company sponsored the 2017 Special Olympics, and encouraged its employees to participate in the Ride to Conquer Cancer bicycling event, a 200-km trek from Toronto to Niagara Falls. As part of the North American International Auto Show, it challenged Lawrence Technological University industrial design students to envision what the car of the future would look like, awarding one designer with a Magna Bold Perspective Award. 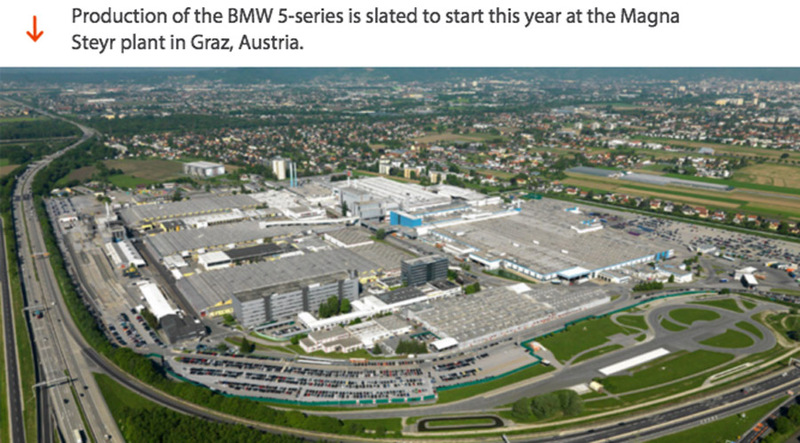 Magna International is also making an environmental impact. In recognition of the energy-efficiency projects implemented across seven of its Canadian manufacturing facilities, the company received a continuous energy improvement award late last year from Enbridge Gas Distribution in recognition of Magna’s reducing gas consumption by 2.75 million cubic meters, the carbon footprint equivalent of planting 1,600 trees. Finally, Magna was named by its employees as one of the best places to work in Forbes’ 2017 list of Canada’s best employers, and it received equally high marks on the employee-review website Glassdoor in Austria, Mexico and Russia. Considering that Magna has more people on its payroll than the population of Fort Collins, Colo., that says a lot about how this international company treats its people. In a day where consumers are increasingly skeptical about big companies and their “profit margins first” focus, it’s refreshing to see one that cares about more than the bottom line. Innovation, contribution to the community and a drive for continuous improvement are just a few of the attributes that separate Magna from other large organizations. So, the next time you’re standing on the showroom floor at your local car dealership, awed by the electro-mechanical wizardry surrounding you, just remember that much of it was made possible by OEM parts suppliers like Magna.